I want you to use this site to enhance your enjoyment of motorsport in general but especially as regards Formula 1, C.A.R.T., and World Rallying. 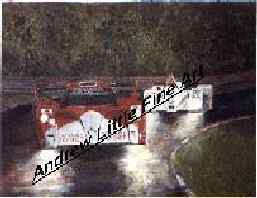 As I complete a new painting I will add it to these pages.Please note that in order to protect the copyright of these artworks they are not necessarily reproduced here in crystal clear quality.Hopefully though you get the general idea. 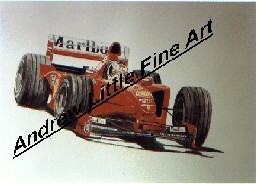 This painting is in acrylics on a 20"x30" canvas.It depicts Eddie Irvine on his way to victory in the 1999 Austrian G.P. 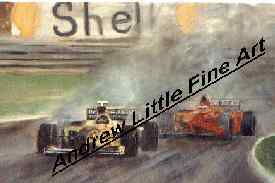 This is a small oil painting which measures 20"x 12"..It shows those old adversaries Hill and Schumacher in the rain-soaked Belgian G.P of 1998. 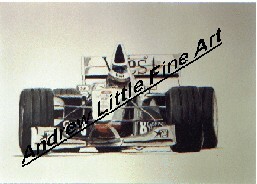 More compact artwork here in the shape of a watercolour the actual image size of which is only about 12" across.Anyway Michael out and about in his F.399. 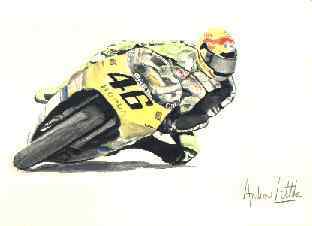 Another different media for you now - acrylic paper (20" x 16").Mika in action during the 1998 season , surely his finest hour so far in his career. 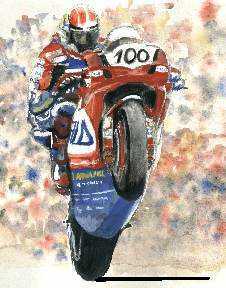 Away from Formula 1 and onto other branches of motorsport starting with the World Rally Championships.Acrylic paper once again and the same dimensions.Carlos gets airborne in the 1999 Corolla. The Number 2 Toyota G.T.One driven by McNish battles with the eventual winning B.M.W. 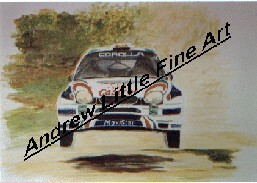 during the early hours of Le Mans 1999.Another small size oil painting this time 16" x 12". 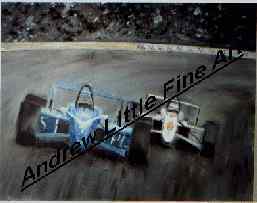 I was feeling very sad when I did this painting as Greg had been killed during the last race of the CHAMP Car season at Fontana a few days before. 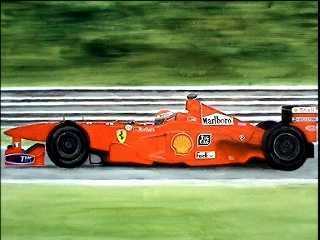 One of his most impressive drives of what was to be his final season was at Motegi in Japan which is where we see him here holding off Max Papis.Anyway for the record this is an oil painting 20"x16".Please Note. There is now a book available entitled 'Greg Moore: A Legacy Of Spirit'. It has been written by the distinguished writer on American motorsport Gordon Kirby and includes a foreword by Jacques Villeneuve. It may still be available from the 'champcarworldseries.com' store. On a brighter note this is the sort of thing I want to update these pages with as the season progresses.Jenson's first G.P start - five places made up on lap 1! 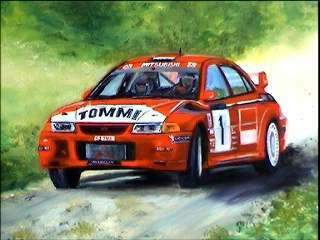 Tommi at work in the 1999 Mitsubishi Lancer World Rally Car. Oil on canvas 24"x 18"